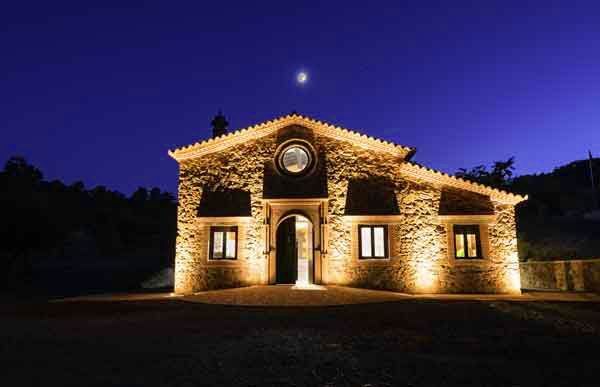 The house El Tornero III is of new construction, opening to the public on August 2 013. It is located on the same farm as the Tornero next to the saltwater pool that it shares with the other houses. It is built with the same criteria as the previous ones, stone of the land and Arab tile, giving a Moorish point to its decoration. It has an area of ​​250 m2 on two floors, with wooden ceilings and chestnut pots. This house has installed an integral solution for all your thermal needs, based on the AEROTERMIA, It is also equipped with a central vacuum installation. Next to the house there is a resting area with barbecue where you can enjoy Iberian meats, typical of the area, as well as a large parking area. Regarding its distribution is similar to the house El Tornero II. You enter directly into a spacious living room with fireplace prepared for 22 people. Next to the living room there is the fully equipped kitchen with refrigerator, refrigerator, ceramic hob, oven, microwave, dishwasher and all the necessary utensils for its proper functioning. On the ground floor you have three bedrooms with two single beds, wardrobe, bedside tables, desk and chair. Direct ventilation to the outside. Provided with bedding and towels. Completing this floor are two bathrooms, one of them adapted for the disabled.